One of the least discussed aspects of socio-political life in post-independence Bharat is the hold of a virulent, supremacist brand of Christianity in the North East of the country. We had recently reported how news of a veteran Congress leader and ex-CM of Mizoram attending a separatist rally to demand an ‘Independent Christian Republic of Mizoram’, was largely ignored by national media. This is to educate readers towards stellar results of ‘Nagaland for Christ’ and Christianity. 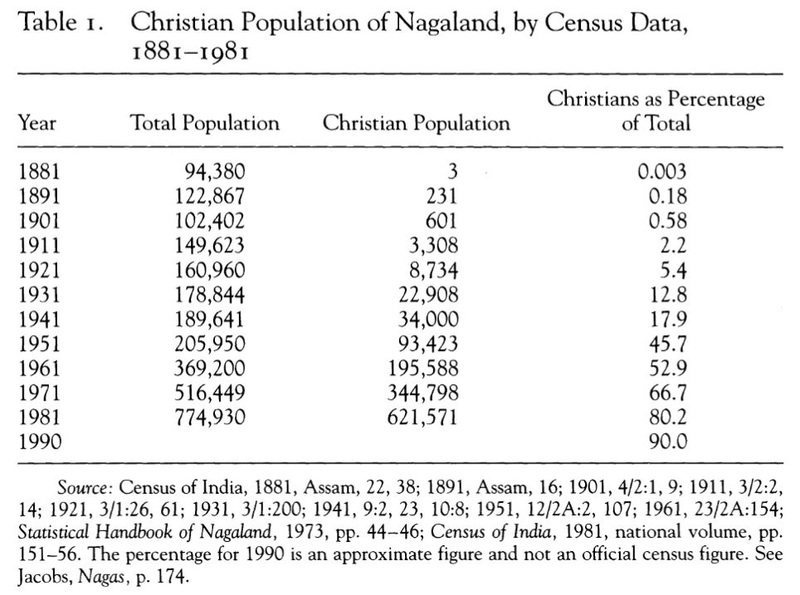 Thanks to Baptist Missionaries and now their counterparts from Kerala and South Tamil Nadu, as per the Census 2011, Christianity accounts ONLY for 87.93% in Nagaland. My question is, what about the rest 12.07% ‘heathens’? Why are they being denied ‘heaven’? The missionaries wrote the texts and trained the teachers. All of this was funded by the taxes on Bharat. This is one of the lessons the divide-and-rule British Colonizers learned from Bharat’s First war for Independence in 1857. Of course, Baptists also undertook outright forgery and interpolation as all the missionaries do to this day. They appropriated/stole the culture of the targets. For example, in the case of Angami Nagas, it was about changing ‘Yehova’ into ‘Ukepenopfu’ and making Nagas believe that all is normal. Nagaland had been converted into the conversion factory for Christ where the Baptists left no stone unturned by using plain forgery, interpolation of myths, cash incentives, admin measures of Britishers and plain deception to fool and convert the local Naga population into Christianity.